PHILADELPHIA, PA. – In the last week alone, Hamas, a terrorist organization, has launched 150 rockets at Israel’s south. Currently, 15% of Israel’s population is currently under a terrorist attack. Israel cannot tolerate the escalation of rocket fire aimed at its citizens. To impair the terrorist infrastructure, the Israel Defense Forces (IDF) responded with targeted strikes against those responsible. The Israel Air Force (IAF) seriously impacted Hamas’s long-range missile capabilities and underground weapons storage facilities. The IAF has acted restrained and surgical in its response to the Hamas missile escalations, and has not targeted the long-range missiles stored in mosques, schools, and hospitals. Hamas, conversely, is deliberately firing at Israeli civilian population centers, including schools, hospitals and houses of worship. 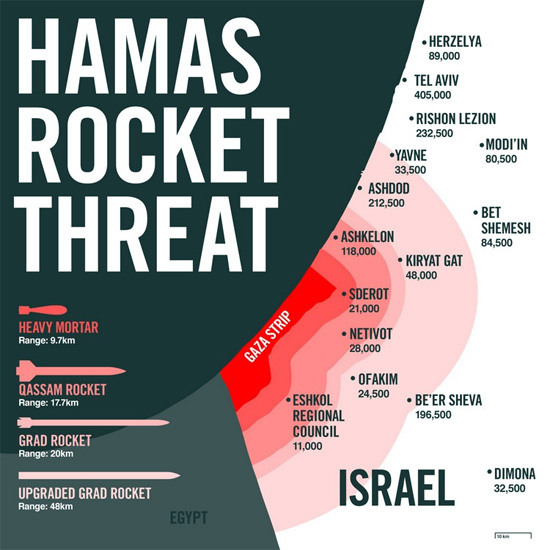 Hamas rockets fired at Israeli civilians in the past have had a range of up to 25 miles. Today, the IDF targeted the Fajr-5, which has a range of nearly 40 miles, putting three million Israelis within terrorist missile range. This additional range encompasses the major metropolitan area of Tel Aviv. As part of Operation Pillar of Defense, Israel eliminated Ahmed al-Jabri, the head of the Hamas military wing, who joined Hamas in 1995 and rose to a senior leadership position in 2004. He was directly involved in numerous terrorist attacks against Israel, including the kidnapping of Gilad Shalit.